We are now in the final weeks of Screen Plays as a formal research project, and while we feel that we have achieved much of what we set out to do, inevitably there is still a lot to do. Perhaps you have noticed that our posts here have become rarer than hen’s teeth, and that has a great deal to do with the time that Dr Amanda Wrigley and I have been spending on populating our database. But we thought it might be useful to come back to the blog to provide an update of what we have been doing – and what we still have to complete. 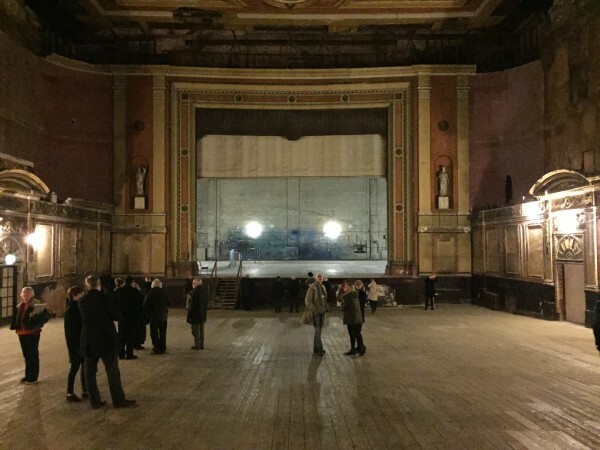 We held our second conference, Theatre and Television: Adaptation, Production, Performance, at Alexandra Palace over a day and a half in mid-February. Apart from the fact that some of us got lost walking what seemed like miles to dinner on the first evening, everything went very smoothly and we were delighted with the contributions. Special thanks are due to RSC Artistic Director Gregory Doran who took time out from rehearsing his production of Death of a Salesman to reflect on the process of adapting stage productions of Shakespeare to the screen. 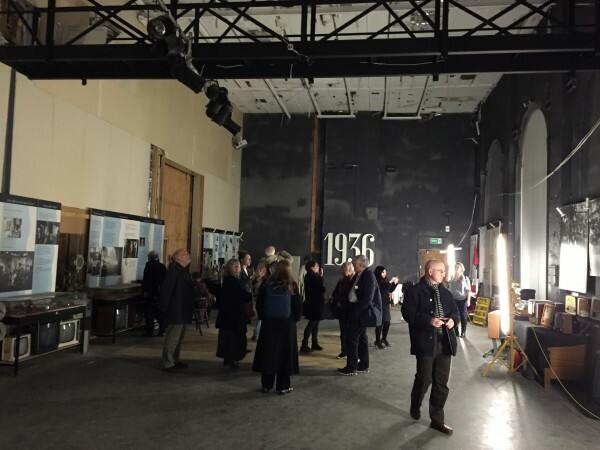 Additional treats included being taken into the astonishing abandoned theatre that is part of the complex (above right) and then, right at the end of Friday, having the privilege of visiting Studio A from where the first television broadcasts were made back in November 1936 (below right). Our friend Dr Billy Smart presented a very strong paper which he has since posted online, ‘Two television configurations of John Osborne: The Hotel in Amsterdam (ATV/ITV, 1971 and BBC4, 2004)’. about television adaptations of two plays by John Osborne which can be found here. Billy also kindly wrote a positive review of the conference for the Critical Studies in Television blog, which is here. Our colleagues at the Forgotten Television project organised a terrific conference last week at Royal Holloway, University of London: ‘Television drama: ther forgotten, the lost and the neglected’. John presented his paper ‘Looking for Fred: what can we know of the lost television of producer Fred O’Donovan’, which developed from a long-ago blog post here, ‘Introducing Fred O’Donovan’. Billy’s paper ‘”Half-hour studies in resentment”: Howard Barker as television playwright, 1972-4’ is also now available online. One of the other organisers of the Forgotten Television conference was Dr Lez Cooke, and BFI Publishing have just brought out the second edition of his essential Television Drama: A History, details of which are here. The editing of our Screen Plays collection of essays which is contracted to Manchester University Press has been slower than we would have liked, but we are determined to pull it in to shape over the next month. And then there is the database, which when complete will include details of all plays originally written for the theatre which have beeb produced on British television since 1930. We have been collaborating on the construction of this with the British Universities Film & Video Council (BUFVC), and in the next fortnight or so we intend to issue an invitation for Beta testers to explore what we have created to date. If you would like to be part of this process, please e-mail a.wrigley@westminster.ac.uk. « ‘Greek tragedy on the small screen’ is revived in Birmingham!